ATLANTA (RNN) – Drug overdoses killed more than 72,000 Americans in 2017, up 6.6 percent from the year before, according to estimates from the Centers for Disease Control and Prevention. The overdose death toll has doubled over the last decade and claims more than 180 people a day, the CDC stats show. 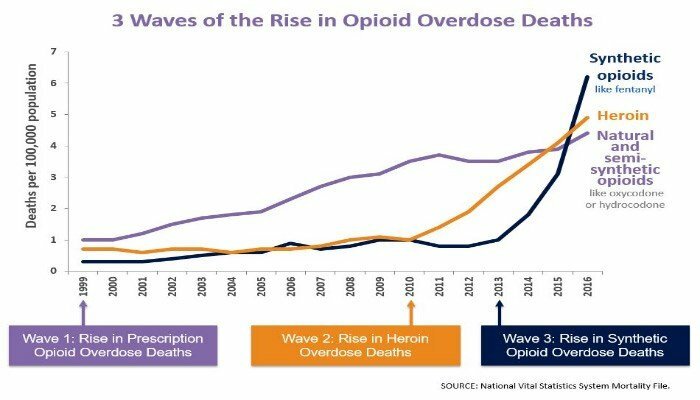 Opioids are the biggest cause of overdose deaths. The CDC projects some 49,000 people will have died from them in 2017 once all the counting is done. Opioids include prescription painkillers (oxycodone, hydrocodone, codeine, morphine) along with heroin and other illegal synthetic opioid drugs. It’s the synthetic opioids, including fentanyl, that appear to be fueling much of the increase in overdose deaths. Fentanyl is a powerful synthetic opioid painkiller that is similar to morphine but is 50 to 100 times more potent. In 2017, there were more than 29,000 deaths involving those drugs, a 22-fold increase from 2002. Fentanyl contributed to the deaths of musicians Prince and Tom Petty, according to their autopsy reports. The highest drug overdose death rates (based on percentage of the population) came in West Virginia, Pennsylvania and Ohio. Plains states had some of the lowest death rates.